You may remember I.F. 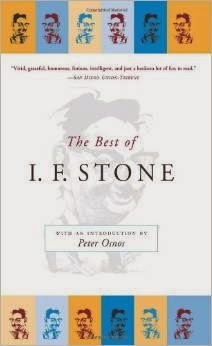 Stone, the blacklisted journalist who published I.F. Stone’s Weekly. It’s lucky that Stone's heyday didn’t occur during the age of the internet (though he lived until l989, he was forced to retired in l971 for health reasons). He would have been just one of thousands of bloggers and his unique voice would unlikely have been heard. Ironically his words live on today on his web site and in published collections precisely because they were not blogged (blogs are too ubiquitous and accessible to attract most publishers) Back then it took some wherewithal to publish and mail a newsletter, especially if you had limited means. Today, is all you have to do is go to WordPress, Google or GoDaddy and you can start your own organ for free. You won’t have to worry about mailing costs as chimp mail will handle the delivery of your message on a weekly or even daily basis at no cost. Obviously there are some bloggers with access to important sources who have big followings. Stone was a good reporter and he probably would have figured a way to prosecute the kind of issues that gave him a following, but undoubtedly the message of many would-be I.F. Stones is lost in our Big Data age. The fact that so many people have been empowered by social media is obviously a good thing, but ironically the democratization has also disempowered them to the extent that their cries are lost in the chorus of humanity. The internet and in particular social media are like the Tower of Babel. They tempt the gods with an enormous ambition that eventually leaves individuals more isolated then ever. Social media have proved extremely effective in mobilizing crowds during Arab Spring and elsewhere. But if you want your voice heard, you’ll probably get more bang if you expend the extra few bucks necessary to S mail your own version of I.F. Stone’s Weekly to the few people you know who really care.